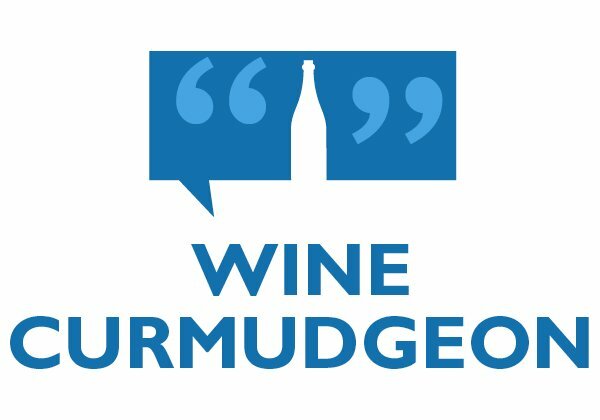 Reviews of wines that don’t need their own post, but are worth noting for one reason or another. Look for it on the fourth Friday of each month. • Palma Real Verdejo 2017 ($10, purchased, 12%): This Spanish white blend is a Total Wine private label that tastes like it’s supposed to — tart and lemony, simple but not stupid. It looks to be some sort of knockoff of the Marques de Cacera verdejo, but is better made and more enjoyable. Highly recommended. • Provinco Bianco Grande Alberone 2017 ($9, purchased, 13%): This Italian white blend, which includes chardonnay, is more Aldi private label plonk. There is little varietal character, save for some chardonnay mouthfeel. Otherwise, it’s thin and bitter. 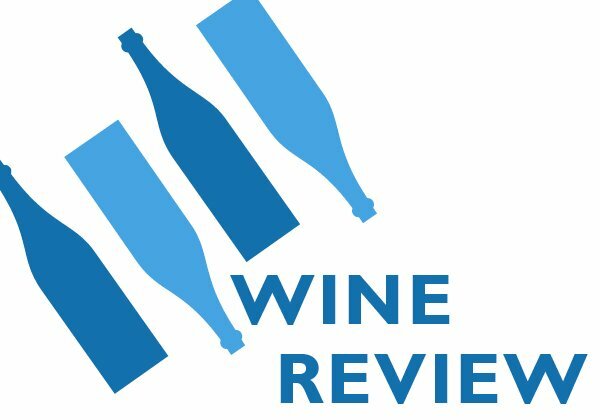 • Weingut Berger Grüner Veltliner 2017 ($12/1 liter, purchased, 12%): Yet another Wine Curmudgeon attempt to understand why so many wine hipsters recommend gruner veltliner, an Austrian white. As my pal Jim Serroka said, and he doesn’t pay much attention to wine, “it’s thin and watery.” Look for a little citrus fruit and not much else. • Familia Bastida Tempranillo 2016 ($10, purchased, 13.5%): Another top-quality Total Wine private label – a Spanish tempranillo that is varietally correct with soft cherry fruit, a hint of spice, not too much oak, and all surprisingly integrated. • I’ll believe it when I see it: The Wine Curmudgeon long ago stopped trusting discount grocery Aldi when it came to wine; I’ve spent too much time shopping there to swallow the chain’s wine hooey when the big seller is Winking Owl. But Aldi is at it again, “touting its award-winning wines” as part of a four-year, $5.3 billion remodeling and expansion effort in an interview with Forbes. I’ll repeat the interview I had with my store manager when the remodel and expansion was announced: “Wine? We have lots of wine. 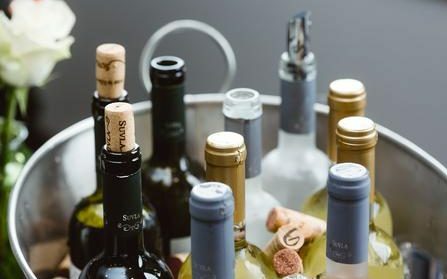 Why do we need more?” It would be one thing if Aldi added the cheap, high-quality wines it sells in Europe, but it appears to have taken the path used by most U.S. supermarkets – cheap, poorly made wine, sold because it’s cheap. • Corks are now perfect: Or so say the cork people, in announcing its latest tech upgrade in cork production. 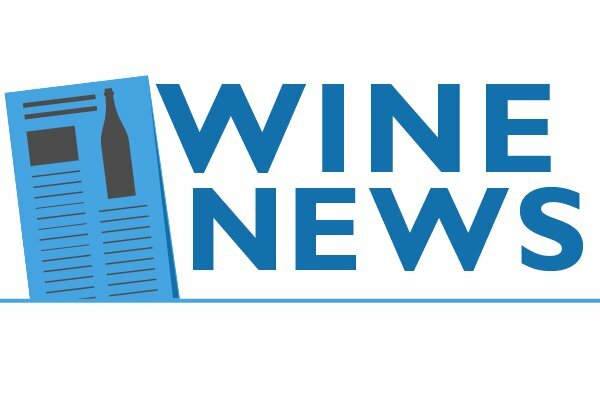 “This will change the wine world,” says the headline, but it doesn’t include the caveat for the worse. It’s good to know that we will still need a special, difficult to use tool to open a wine bottle when more and more people are not drinking wine. That’s sure to do convince them to move over to wine. By the way, those of you will are going to cancel your email or RSS subscription to the blog (because several of you always do when I write about corks): Use the safely unsubscribe button at the bottom of the email. Why can’t Aldi wine in the U.S. be as cheap and as interesting as it is in Europe? Aldi, the discount grocery store chain that has wowed Europeans with its quality cheap wine, seemed ready to do the same thing in the U.S. this year. It was facing increased competition in wine from Walmart, Target, and Kroger, as well as the arrival of its European arch-rival Lidl to the U.S. But the result so far? What a disappointment. • Just one European wine, an Italian white that looks to be a knockoff of Costco’s private label pinot grigio. • An 85-point California pinot noir for $13. 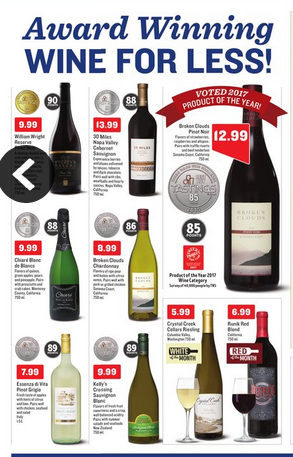 Someone needs to tell the Aldi marketing types, first, that 85 points is about a special as a new shoelace, and second, that I can buy a dozen $10 grocery store pinot noirs that get more than 85 points. And we all know how I feel about scores. • A $10 New Zealand sauvignon blanc. Why do I need to buy a $10 New Zealand sauvignon blanc at Aldi? I can do that at Kroger. The point of this is that Aldi delivers so much more in Europe. I had high hopes we would see that here when Aldi arrived, and I have bought great cheap wine at Aldi – the short-lived, but incredible Vina Decana and its replacement, the always dependable $5 Vina Fuerte. But the rest? Just more private label versions of the same old supermarket plonk that I don’t buy at the supermarket. And Winking Owl. Lots and lots and lots of Winking Owl. Why is the chain settling for so little here? Has it bought into the grocery store mindset that U.S. consumers will drink whatever is put in front of them as long as it has a score and a pretty label? Is it because it doesn’t see wine as important to sales in the U.S. as wine is in Europe? Or is it just not doing a good job? Regardless, I want more. I want the same $6, $8, and $10 wines their European customers get. Is that asking too much from what is supposed to be one of the world’s great discount grocers? • Cheap rose forever: Imagine the Wine Curmudgeon’s shock when saw this sign (the one at the top of the post) at his local Aldi – a media-induced shortage of rose. As much as I would like to take credit for this, it’s the fault of NBC’s The Today Show, which ran a piece on the $9 Cote des Provence rose at the beginning of June. The clerk at my Aldi said the warehouse has been out of the wine for weeks; hence the sign. What’s most interesting is not that the wine is sold out, because anyone who follows the WC knows cheap pink wine is one of the wine world’s great finds. 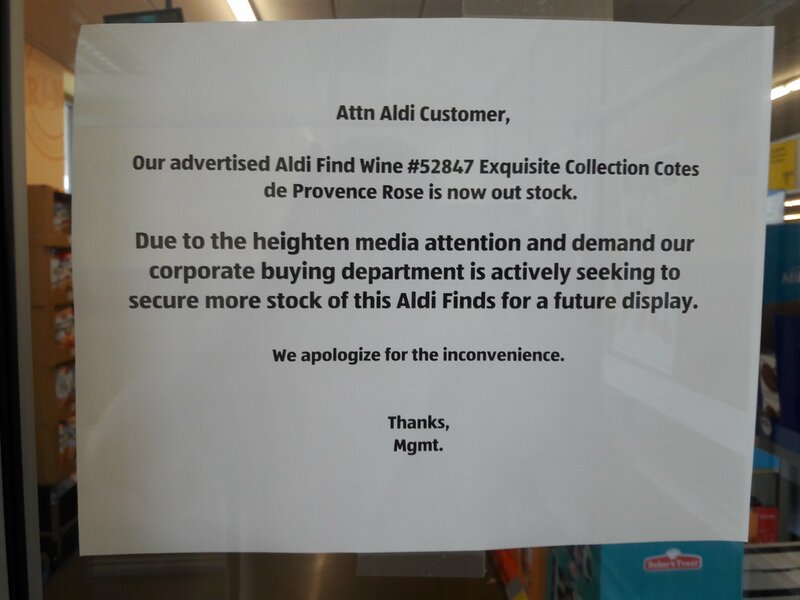 Rather, that the Provence has been sold in Britain, and that Aldi is bringing it to the U.S. Aldi hasn’t done that with many of the the wines it sells in Europe, instead selling a variety of very ordinary domestic wines in this country. Could it be that the chain is feeling the heat in the U.S. from the debut of its German arch-rival, Lidl? And yes, if and when it ever shows up at my Aldi, I’ll review it. • Constitutionally protected: The Supreme Court has agreed to decide the constitutionality of a New Jersey law allowing sports betting. Why is this important to wine drinkers? Because the court has never, as far as I know, agreed to decide the constitutionality of the three-tier system that governs the sale, manufacture and distribution of booze in the U.S. But gambling, somehow, gets a hearing? And, if the court sides with New Jersey, it means any state can legalize sports betting – even if they don’t allow you to buy a bottle of wine from Amazon or six-pack of beer on your way to the lake on Sunday morning. If there any constitutional scholars in the audience who can explain why this is not hypocrisy of the highest order, send me an email. 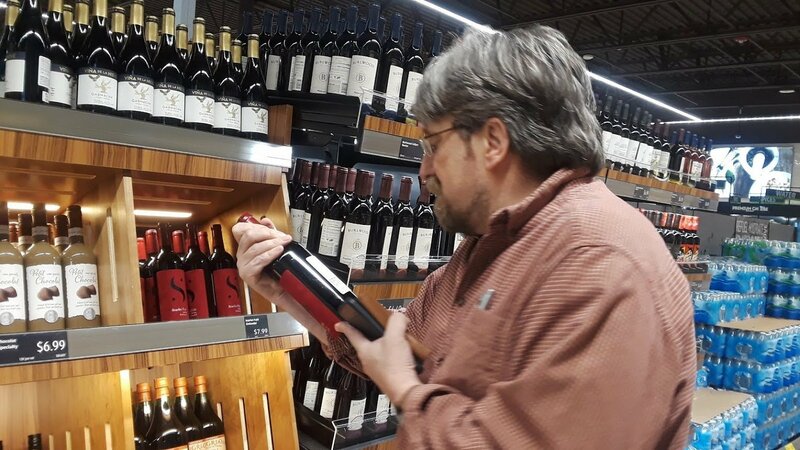 • Only 14 states: Speaking of which, Tom Wark of the National Association of Wine Retailers reminds us that only 14 states allow consumers to purchase wine from out of state retailers. Interestingly, New Jersey is not one of the 14. But if gamblers will soon be able to take the Cowboys and the points in an Atlantic City sports book, perhaps the state will reconsider. 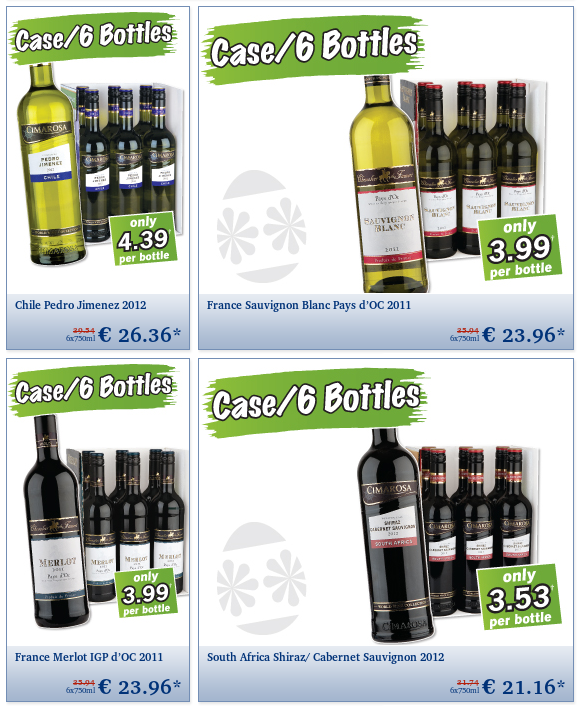 Will Lidl sell these kinds of wines at these prices in the U.S.? Those of you who live in Virginia and the Carolinas can see first-hand whether Lidl, the German discount grocer, is serious about changing the way grocery store wine is sold in the U.S. One of its grand opening specials: An award-winning Prosecco, the Italian sparkling wine, for $9 – a wine the chain claims is comparable to the best-selling Prosecco in the U.S., E&J Gallo’s La Marca. 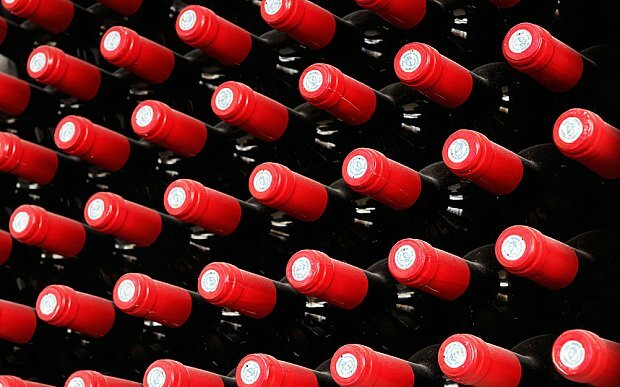 Welcome to the U.S.’ grocery store wine war. In this, Lidl’s selection will be more reminiscent of what its does in its European stores than what arch-rival Aldi has done in the U.S., where the latter has stuck with less expensive, but still very ordinary wines like Winking Owl. In the U.K., where wine plays a key role in product assortment, Nielsen says Aldi and Lidl controlled 13.3 percent of the market in the first quarter of 2017. These wines, including a $7 Chilean malbec, will be exclusive to Lidl, just as you can only buy Two-buck Chuck at Trader Joe’s (though hopefully the Lidl wines will be of a much higher quality). 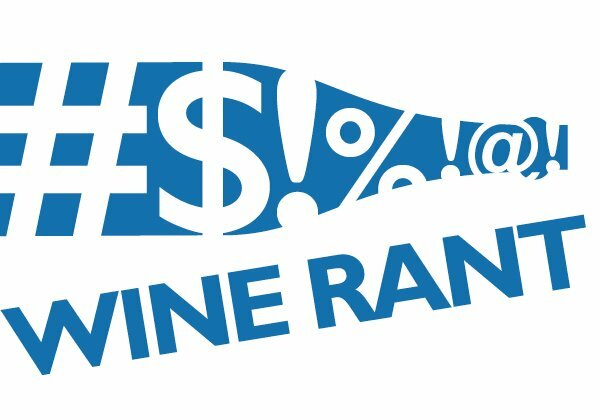 Two questions remain, though: First, can Lidl convince consumers to buy its wines, which they have never heard of, in the same way they buy little known wine from Trader Joe’s and Costco? Second, will Lidl’s effort force the rest of the grocery store business to respond with better prices and higher quality wine? I’ve talked to Harwood several times over the past couple of months, and he says he wants me to try the Lidl wines. I’m looking forward to the opportunity, probably later this summer, and will report back when I do. 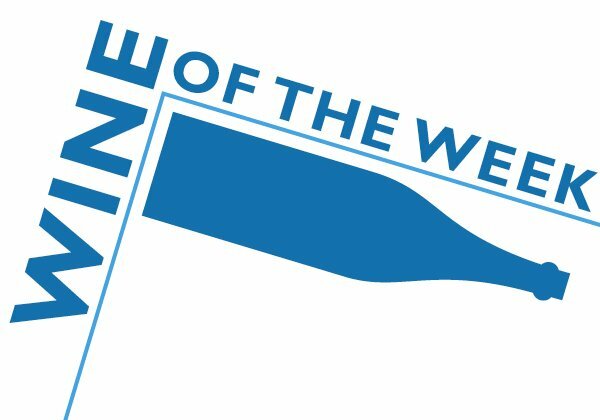 This week’s wine news: Aldi will expand its wine selection, plus the wine business continues to bifurcate and $80 student wine. • More cheap wine: Aldi, the German discount grocer whose cheap wine often shows up on these pages, will spend $1.6 billion to renovate its 1.300 U.S. stores. Part of the renovation, reports Blomberg News, will be upgraded wine sections, “housed in fancier wood fixtures with spotlights.” This is good news for those of us who care about quality cheap wine – Aidi’s wine is one reason why it has become the fifth biggest supermarket chain in Britain. It’s also worth noting that Aldi and its arch-rival Lidl, which will debut in the U.S. next year and also does great cheap wine, have almost 11 percent of the U.K. grocery store market. The losers in the two retailers’ growth were Britain’s biggest chains, the counterparts to Kroger and Albertson’s in this country. • Two wine markets: We’ve talked here many times about the divide in the wine market, between the premiumized high end and the wine that most of us drink. 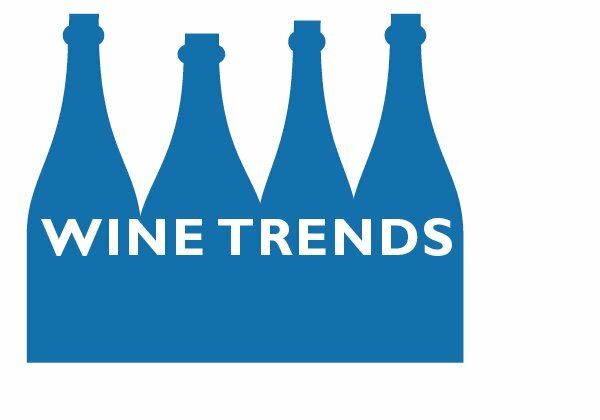 Tom Wark at the Fermentation blog offers insight on this subject: “It is becoming abundantly clear that there exist today in the United States two very distinct and separately operating wine industries. One, the larger of the two, is dedicated to selling relatively inexpensive wine to the masses. The other is dedicated to selling relatively expensive wine to a smaller group of wine lovers. What’s interesting about these two separate industries is that there is less and less for their members to talk to each other about.” Wark’s other point? That no one in the wine business seems especially bothered by this, and is perfectly content to let it happen. No wonder I’m so cranky so much of the time.